Marc Sings For You. Why doesn’t everyone? I recently wrote something about the future of classical music, and asked whether classical artists like James Rhodes and Thomas Hewitt Jones were leading the way by using social media to break down the stigma which normally goes along with classical music. This time I want to look at another example of an artist – this time pop rather than classical – who’s trying innovative ways to reach fans and make a career in the modern era of net for nothing and the tunes for free. Marc with a C is a modern day pop troubadour, writing songs in a varied but reliably catchy pop vein. That isn’t ‘pop’ in the sense of the Top 20 singles chart, which these days actually tends to mean R&B and dance junk. As listeners of his regular music podcast “The Real Congregation” know, Marc’s a real believer in the tradition, and I guess nobility, of pop music and how great a thing the 3-minute pop song can be. Though his music tends to be straight up pop (and I mean that in a good way), his lyrics range more widely, often surprising with their content or style. I’m not going say too much more about his music here – because it’s all available to hear for free at Bandcamp and his website. I also think he’s an artist whose large back catalog will hold different gems for different people. So if you don’t know his stuff, go take a listen. I’ll wait. So aside from being a prolific singer-songwriter and performing regularly in Florida over the last 10 years, Marc is (like any modern self-respecting indie musician) active on Twitter and Facebook. And though he sells his music through his website and Bandcamp, he regularly sends out the clear message that what he primarily wants is for people to listen to his music. Should they see fit to pay him for it, that’s a bonus. 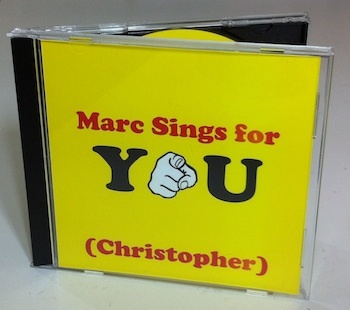 And so we come to the real subject of this post: the “Marc Sings For You” project. The concept is this: you pay a small fee ($25) and Marc sits down one day with four songs of your choice from his vast back catalog, plus another four chosen at random (traditionally by pulling slips of paper out of a hat, but now instead by exploiting the shuffle feature of an iTunes library loaded with his songs*). He performs and records the songs for your personal listening pleasure, and then sends the tape or CD to you soon after. I stumbled onto this page on his website in December and instantly knew what I’d be asking Santa for at Christmas time! I put my request in with Santa and waited patiently…. At the time I struggled to quite express why this was surreal to me. I’ll try again here. 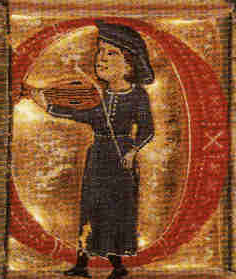 In days of yore, musicians made a living by performing. They strolled around the countryside, playing folk songs for folk people in exchange for food, lodgings and maybe some gold coins. At least, that’s what fantasy novels and a weak grasp of medieval music history would have me believe. The point being: that rarely happens today. The advent of recorded sound triggered a momentous shift from the value of music being placed on its live performance to the recorded article, available for exact replication any time your heart desired. Now I’m pretty far from being a luddite, and I love my collection of recorded music as much as the next guy. But there’s something special about live performance. and even if you manage to catch your favourite artists in concert these days, it’s vary rarely anything like an intimate performance in a tavern with the musicians almost within arm’s reach. Yet my favourite gigs have always tended to be those smaller ones. Catching Wheatus and MC Lars in a small pub in Leicester in 2007. The Mountain Goats on a small stage in Manchester in 2009. Random unknown acts in various small pubs over the last however many years. Unfortunately the benefit of easy unfettered music discovery via the internet backfires somewhat when it comes to enjoyment of live music: the only musicians who can afford to make it from whatever country they come from to the place where you live will, at least if you’re outside the mainland US, be larger acts (who can afford an international tour). The chances of those intimate experiences are therefore greatly reduced, leaving you with a choice of restricting your music listening to local acts who you have a chance to see live, or living with the frustration that you’ll probably never get to see some of your favourite bands play live. Which is all just a long way of saying: I love to discover music online. I love the lack of barriers between countries and genres, and I’ve found some amazing music online over the last decade. But I generally have to assume the chances of seeing those bands live are slim to none, and that’s a real pity. Marc with a C definitely fell into that category for me. Here was all his recorded music available for my listening pleasure, but from his chat I got the impression he mostly played locally and the chances of an international tour were pretty small. So one more tremendous artist who I would never get to see play in real life. Now this unfortunate distance between fans and artists is mitigated somewhat by social media (as discussed in my previous post). And it’s been quite amazing to me to have a bit of Twitter interaction with musicians I love over the last few years, like Sticks Downey, Beefy, Torley – and Marc himself. And that’s always felt slightly surreal to me. Of course I understand they are real people sitting at a keyboard just like me and there’s no reason they shouldn’t tweet at me. But it still feels pretty insanely cool when they do. I’m not generally susceptible to fanboyism, but a tweet from a musician I dig definitely brightens up my day. Anyway, so taking that surrealism to a higher level: the idea of an artist I love doing a performance just for me. Of songs I requested. And then to find out from them that they’d just recorded it and it would be in my hands soon. The juxtaposition of ‘remote artist in internet-land’ with ‘personal troubadour performance’ was a strange one, and a cool one, and I ended up comparing it to getting a letter from the queen on your 100th birthday. I was pretty impressed that even the album art was personalised! I couldn’t wait to hear the album. I listened immediately, with my wife (who played the role of Santa in this tale). She’s heard quite a bit of Marc’s music when I’ve played it at home, but doesn’t know his songs all that well. Nevertheless she was really into it and we were both cracking up at Marc’s between-song banter, and grinning through the performances. The CD exceeded all expectations. I guess I was expecting just the bare minimum: four songs I’d requested and four others. Being an engineer, my mind automatically tries to optimise processes, and being more cynical than I would like, I must confess I wondered if Marc would use the same recordings of 4 randomly-selected songs for all the Marc Sings With You tapes he was recording in a given session. The description on the website gave the impression that everything was uniquely performed just for you, and Marc seems like a straight-up guy, but hey – I’d understand if he bent the rules a little for the sake of efficiency. But no. There was no cutting corners here. What I got was a full 50 minutes of Marc with a C, talking to me, addressing me by name (again, slightly surreal!) and rocking fantastic performances of my chosen songs and four great extras. And explaining the backstory behind a few of the songs (most notably “No London in Brazil”, a song whose lyrics I love but had never really understood!) as if he had all the time in the world to hang out recording this CD for me. Oh, and a bonus track thrown in at the end, a concert recording of “Motherfuckers Be Bullshittin'” because he hadn’t felt he could do the call-and-response section at the end of the song justice without a backup singer or audience – and didn’t want me to miss out. Warning:May be unsuitable for younger listeners. Or Glee fans. Outside his confident musical performances and his strong radio personality, Marc gives the impression of being a pretty humble man, and the asking price of $25 (incl. shipping) for Marc Sings With You is a clear example of that. At that price I’m sure the cash vs. time tradeoff for this project can’t make for a sustainable business model – it’s clearly more a labour of love. But as an extra package to offer dedicated fans, the personalised performance CD is something I wish more artists would start offering. A personal concert by John Darnielle, MC Frontalot, Jonathan Coulton, Owen Pallett? Or even mainstream artists like Cerys Matthews, Emmy the Great or E? That would be amazing. At $25 total per disc, maybe it’s not workable. But having received my Marc Sings For You CD, I can say without hesitation that it’s worth a lot more than that to me. Would I pay $100 for a recording of a personalised performance by one of my favourite musicians? Yes, yes I would. So what the hell is wrong with Marc with a C? Absolutely nothing. The man is a true musician in the best possible way. This is a guy who knows how to win fans’ hearts. And amid all the doom and gloom and litigious negativity that surrounds the music industry these days, I put Marc with a C and projects like Marc Sings For You firmly among the things which give me real optimism for the future of music and an exciting new era of professional musicianship. The only question for me is: why isn’t everyone doing it? I discovered Marc with a C via the fantastic nerd/geek music podcast “Radio Free Hipster”. If you like geek rock, nerdcore hip-hop, chiptune or videogame music, do yourself a favour and check it out. * How do I know this strange bit of trivia about Marc’s methods? Because he told me. Between songs, in a concert just for me. My CD from Marc arrived on New Year’s Eve (the joys of living on the other side of the pond) and I was really excited. Listening to it was surreal, especially hearing one of my favourite musicians actually talking to me. The recordings were really good as well. It was interesting hearing a less angry version of ‘What the Hell Were You On?’ and hearing an unreleased song (Tired Old Dicksucker Revue) was awesome. The live version of Motherfuckers Be Bullshittin’ was also great. Now, I will leave… and take the live version of I’m In Love With Everyone I Know.